A great year 2009 has passed for MiaDeRoca and our wonderful webshop. This is the perfect time to say THANK YOU. We thank all our customers and supporters with some lovely give aways: woolly warming things for your digital devices: Laptop Sleeve, Macbook Cover, Netbook Case or iPhone sock. 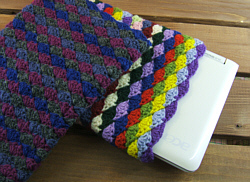 a laptop-, netbook- or cell phone sleeve as you like, individually made for you. If you win this prize you get for your preferred digital device an especially for you handmade cover in the wool colours you like. You can choose between all colours of wool, which we offer in our shop. Wonderful wool creations which are produced in the MiaDeRoca workshop can be viewed here. The laptop sleeve consists of squares in granny style. We used the following wool colours: violet, mauve, lilac, dark green, light green and pink. 2 netbook sleeves in "wonky waves" look. The smaller cover measures 25x17x3cm, it features wonky-waves in dark-grey, mauve, dark blue and jeans blue. 4 cozys for smaller technical gadgets be it Nintendo DS, Playstation Portable, navigation system or digital camera. Four different styles are available: one cover in subtle black an white, fine vintage-style. Gorgeous ist the flower closure of the brown and dark-red cozy. The third is a blue mottled jeans blue light green Nintendo DS cover with fabric covered button. Last but not least we have a candy colour sock, which even could hold a Playstation Portable. 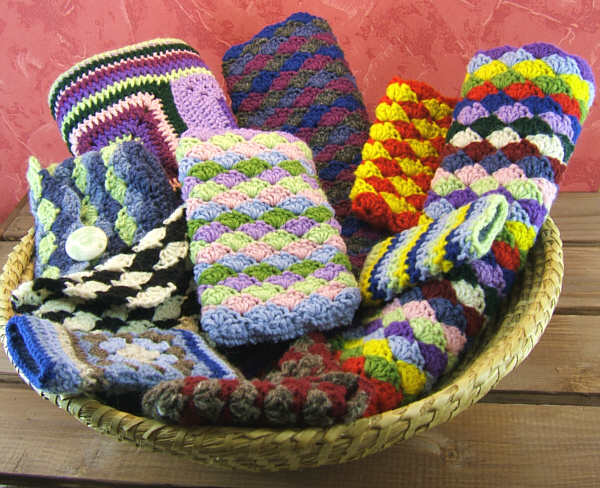 3 cell phone covers: once stripped (11x5x1cm), the second- one is featuring granny squares and stripes (12x7x0,8cm), the third smartphone cover is all red and yellow with wonky waves (11,5x6x1cm) - especially the second and third cover are very well to use for iPhone and others. 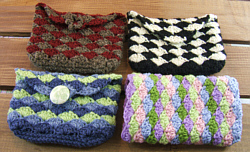 All crocheted covers can be stretched, especially the models "wonky waves" can stretch to more than 10% of their length and width. All products in this raffle are 100% new pure wool, some 100% Merino wool, but all with high percentage of merino wool. You can wash all covers up to 30degrees C in the washing machine. All Covers and sleeves are produced in an animal-free and allergen reduced atmosphere. Write a commentary and tell us which one of the covers or sleeves of the prizes 2-11 you would like. Remeber to add your e-mail address or another possibility for contact in case you are one of the lucky winners - or just pass by again on the 15th of February. The winners will be announced on our MiaDeRoca facebook page. Take part until February 14th midnight. On February 15th we will draw the winners. No cash alternative to any prize. Any recourse to courts of law is excluded. For those who don't want to wait until the drawing: the DIY-set for the digi-bags wonky waves can be bought at our onlinestore.